Before I turned 30, I was a mess in my emotions. But what I didn't realize at the time, was that my thirties would be some of the best years of my life and full of possibilities. As they say...the older you get, the wiser you become. So, here are some lessons learned so far. 1. Stop living life based on a timeline. Just LIVE. 2. Travel often. Don't let money hold you back. 3. Quit the job you hate. There are far better opportunities, if you go after them. 4. Don't settle. Not for anyone or anything. 5. Buy the more expensive bottle of wine. Your body will thank you the next day. 6. While you’re frustrated at being Single. Your married friends will envy your freedom. 7. Stop trying to please everyone. Seriously, it's impossible. 8. Send 'Thank You' notes. Handwritten notes never go out of style. 9. Love the body you have. Stop nagging yourself over those 10lbs. 10. Start a daily skincare routine. 11. Get more sleep. Pulling all nighters gives you dark circles & puffy eyes. 12. Remove toxic people from your life. 14. Learn how to cook & host a holiday dinner. 15. Say 'I love you' more. Tomorrow is not promised. 16. You don't have to have it all figured it out yet. 17. Create goals for yourself. Even small ones sometimes make the biggest impact. 18. Surround yourself with people who truly get you, encourage you and support you. 19. Things will fall apart at times. The key is for you not to fall apart. 20. Don't let your past define who you are. We all have one. 21. Invest in your future. Enroll in a 401K or savings plan. 22. Never apologize for wanting the best for yourself. 23. Life should be lived with no regrets. 24. You will experience loss and it may change you forever. 25. Don't carry the burden for others. 26. Money does NOT define happiness. 27. Failures are not mistakes, only lessons learned. 28. Stop comparing yourself to others. We all have strengths and weaknesses. 29. You are capable of so much more than you think you are. 30. Being successful is not defined by just your job. 31. Move to a NEW city if you're unhappy in the current one you live in. 32. Chase your dreams, even if they scare the hell out of you. 33. Do what makes YOU happy. You visit my blog, support me & share this journey with me here. So, I thought you may want to know a bit more about me on a personal level. 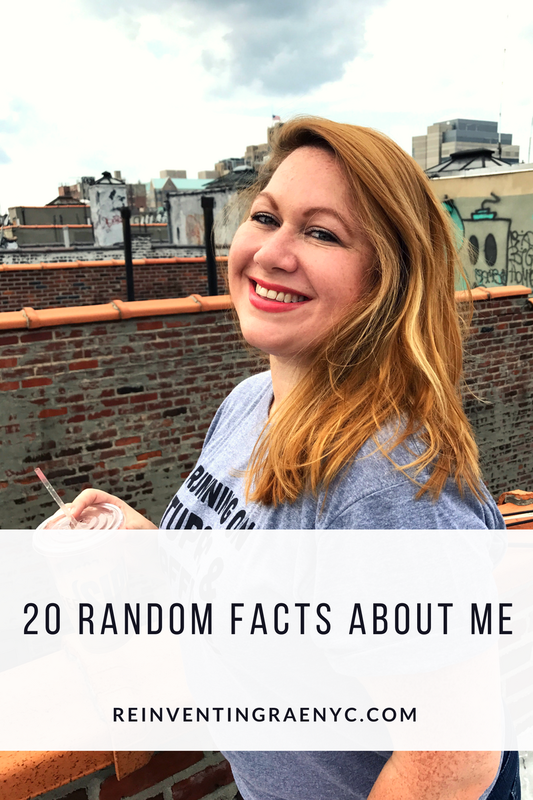 Here are 20 Random Facts about myself. 1. Rae is actually my middle name. It wasn't until my twenties that I really started to embrace it. 2. I'm happiest when CREATING or PLANNING something. Especially party planning. 3. I think handwritten 'Thank You' notes never go out of style. 4. I'll admit, I'm a Real Housewives junkie. My favorite housewife is Bethenny Frankel. 5. I am way more productive if I write out a to-do list. 7. I can recite all the words to 'JUICY' by The Notorious B.I.G. 8. Music is my love language. 9. I secretly wish I could sing and perform on stage. 10. FALL is my favorite season. Pumpkin spice everything. 11. Proud supporter of yoga pants & tank tops. 12. I've always wanted to get a tattoo but I'm too scared to actually do it. 13. I love accessories. Big gold hoops are my go to. 14. I own a ridiculous amount of lip glosses and lipsticks. I carry at least three with me at all times. Anyone else have this prolem?! 15. My favorite movie of all time is 'Dirty Dancing'. 16. The word Y'all will always be in my vocabulary. Blame it on my Southern roots. 18. Never thought I would actually move to NEW YORK. 19. Turning 30 was a game changer for me. 20. Always on the hunt for the best Iced Coffee. Coffee is my VICE. Tell me something about yourself! Comment below.